At a Government holding facility, a dark-suited spook named Mr. Black is briefing members of the Special Operations Strikeforce (Rock, Kid Avenger and Shrew) on the situation. The creature they apprehended (Donatello) claims to be a mutant, not an alien, and is friends with Chicago PD’s Officer Dragon. Unfortunately for Don, Dragon is dead and cannot vouch for his pal. Don suggests they call the Knight Watchman, instead, but no one knows where to find him. Luckily, another S.O.S member, Sara "Horridus" Hill happens to be on the scene and she immediately IDs Don to Mr. Black’s satisfaction. Rock apologizes to Don for the ordeal, and Don reveals that Dragon actually invited him to join S.O.S., though he turned it down. Kid Avenger then alerts everyone to a television newscast. On air, Casey is hamming it up as the savior of the sewers, collecting the $10,000 reward for sacking the man-eating monitor lizards. At the Jones’ apartment, April, Shadow and Casey watch the newscast, which is followed by some very bad news: Casey called in sick at the grocery store so he could go save Leo from the lizards, his boss saw the newscast and now he’s out of a job. Splinter sends Shadow to go soothe the distraught April as Raph, in his Shredder garb, steps in. Splinter condemns Raph’s new occupation, though Raph swears he can turn the Foot around. Splinter reminds him of the Japanese branch of the Clan, and though Raph has as of yet been unable to contact them, he isn’t worried as the Turtles and Karai have had a truce for some time. Parting ways, perhaps for good, Raph puts his helmet back on and leaves the apartment. Down in the sewers, Leo and Mike watch the newscast from Leatherhead’s sanctuary. Nervously, Leatherhead shows them his recently rebuilt transmat device, though he insists they keep away, as he recalls what happened last time the Turtles helped him build a transmat. Mike, however, is more interested in the Utrom floating in a glass stasis tube. Leatherhead releases the Utrom, a friend of his named Doctor X, who was left behind just as he was when the T.C.R.I. building exploded. Doctor X greets the Turtles, remembering them from the T.C.R.I. incident. Doctor X then asks the Turtles to help them complete the transmat, much to Leatherhead’s paranoid reluctance. Time passes and they’ve nearly completed the machine. Rudely, Doctor X decides to test the transmat out on an unsuspecting Leonardo and zaps him away. Pissed off, Mike forces the Utrom to return his brother. Leo comes back… but with a Triceraton Commando at his throat! The Triceraton recognizes the Turtles from their attack on the Republic and swears to defeat them. Leo manages to stun the Triceraton with his own blaster, but things only proceed to get worse: The Triceratons have completed their own transmat devices and a unit of Commandos have locked onto the coordinates of Leatherhead’s transmat. 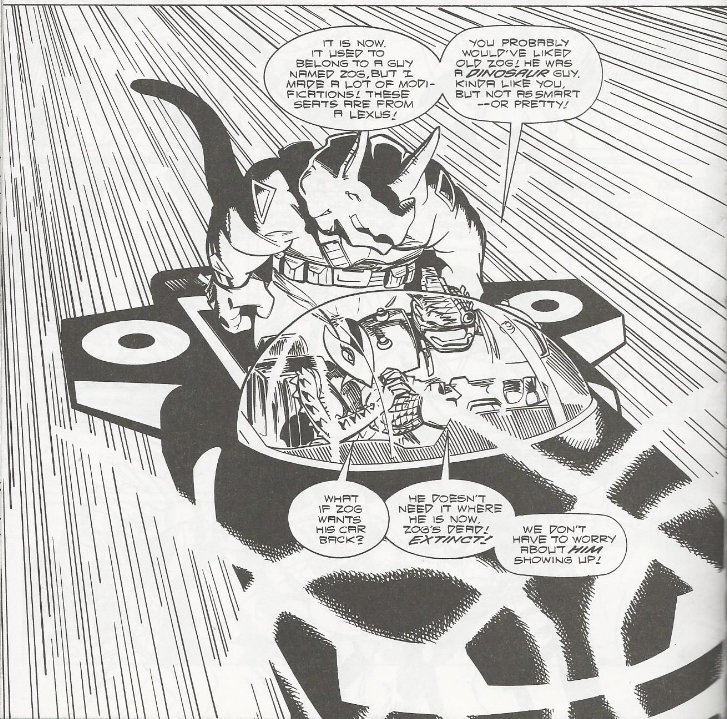 The Commandos begin swarming the sewers, forcing Leo to destroy the transmat before more can arrive. Cutting their losses, the Turtles, Leatherhead and Doctor X escape into a pool of water. Captain Zak, leader of the Commando unit, orders his troops not to pursue but to rebuild the transmat and regain contact with the Republic. His sensors then pick up a homing beacon from the lost Commando, Zog. Hoping Zog might have already built a base on Earth, Zak teleports one of his Commandos to the beacon’s source. *This story is continued from TMNT (Vol. 3) #18. The story continues in TMNT (Vol. 3) #20. *Officer Dragon was killed by Abner Cadaver in The Savage Dragon #50. *The Turtles met Knight Watchman in TMNT (Vol. 3) #9. *Don met Horridus in The Savage Dragon #22 and Mike was last seen with her in TMNT (Vol. 3) #11. *The Turtles brokered a truce with the Foot Clan and Karai back in TMNT (Vol. 1) #61. *Leatherhead’s first attempt at building a transmat device was destroyed in TMNT (Vol. 1) #45. 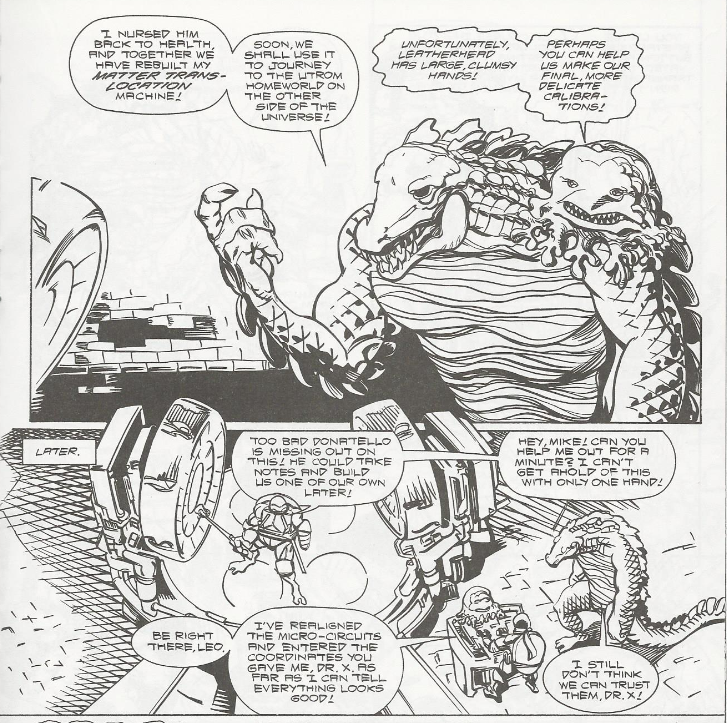 *Leatherhead’s history with Doctor X can be seen in Tales of the TMNT (Vol. 2) # 50, in the story “Threads”, and in Tales of the TMNT (Vol. 2) #38. *The “X” in “Doctor X” is short for “Xeinos”, in case you were curious. *Doctor X recalls encountering the Turtles in TMNT (Vol. 1) #4 and TMNT (Vol. 1) #7. *The Triceraton Commando recalls encountering the Turtles, and Zog’s disappearance, in TMNT (Vol. 1) #6. *Zog died in TMNT (Vol. 1) #20. Whew! That’s a lot of continuity notations! Carlson does his homework, though, as you can see, and packs the issue with as many references as necessary to get the plot across. The return of the Triceratons was something of a surprise story arc in this book and one that I wholly approve of. I dig the Triceratons when they’re utilized right and I dig them even more when Frank Fosco is drawing them. Seriously, he draws some damn cool Triceratons. The gratuitous insertion of more Savage Dragon characters could have been handled better (last issue’s cliffhanger, derived from a conflict that was built up for six issues, falls entirely flat thanks to such a dull resolution), but if there’s any consolation it's that it brought Horridus back into the book. Seeing her snuggling up to Don and flirting with him kind of leaves you with an unpleasant opinion of her, but in reality, she only had one brief fling with Mike and I’d hesitate to call her his “girlfriend” at this point (though she has been keeping saucy correspondence with him in previous issues). Let the girl be promiscuous! 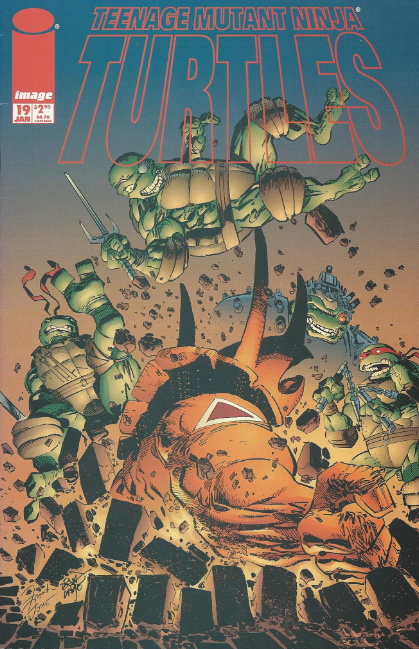 I think the best part of this issue was Raph’s long-overdue confrontation with Splinter. They both share some pretty unkind words with one another and the tension runs deep. Raph criticizes Splinter’s quality as a parent and Splinter concedes; he obviously didn’t do a very good job if Raph is running with the Foot, now. It’s only natural for Splinter to hold a considerable amount of animosity toward the Clan and I can’t imagine any circumstance would convince him to approve of his son’s joining the group, much less leading it. Moments such as this prove that Carlson was genuinely capable of writing more emotional and psychological dimensions to the characters, but alas, for most of the book he opted to stick with action and oneliners. 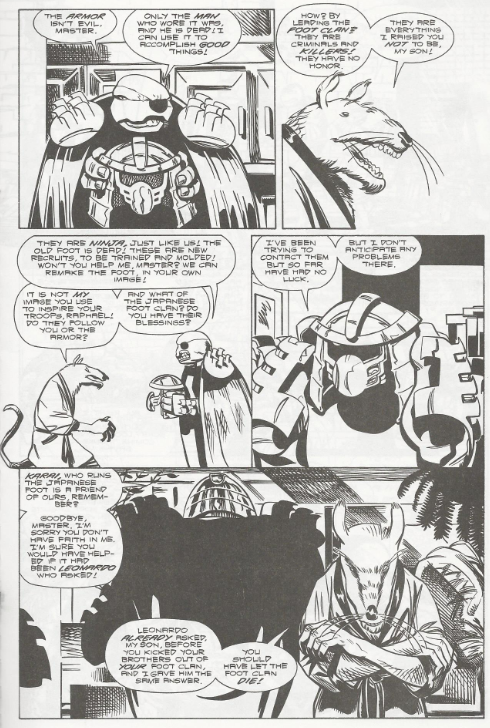 I’m not going to go so far as to claim “wasted potential”, but scenes such as the exchange between Raph and Splinter illustrate that Carlson was capable of something more than what we ultimately got. Anyhow, the book has really been firing on all cylinders for the past few issues, having at last regained its focus. The re-visitation of classic plot threads paired with the continuation of new ones make for an excellent balance and, in my opinion, this is the best the book has ever been, at least in terms of consistency. Sadly, we’re coming down to the title’s home-stretch, too. Yet another one of Image's misleading covers! Ah, that fight scene looks so cool. Thanks! I tried doing research on that, but my googling didn't yield me the best results. So it was Abner Cadaver in Savage Dragon #50, then? The Triceratons have a working transmat in this story, but in the future "Gizmo and the Fugitoid", they were shown to still need one built by Honeycutt. I guess I'll have to no-prize my way out of this one.